D16 and D17, plugged into machined socket pins. About a year and a half ago, I wrote about repairing my K2/100. Part of the fix involved replacing diodes D16 and D17 on the KPA100. The same week I bricked my K3/100, I found the K2/100 was acting up. I was going to grab it in case I needed to send the bricked K3 back to Elecraft. But, before I did that, I spent part of an evening trying to work some of the W1AW-portable operations. I didn't have a lot of luck. The power output seemed erratic on some bands, and on others, the automatic antenna tuner couldn't seem to find a match. Seems to me I'd seen this behavior before -- when the SWR bridge diodes, D16 and D17, had undergone a soft failure. I figured that if this was going to be a regular occurrence, I ought to make the job easier. I found an old machined-pin IC socket and carefully clipped away the plastic to reveal four individual pins. Actually, it was more like six pins, since I dropped one and couldn't find it under my desk. And another one I hopelessly bent. Fortunately, these things come packaged with fourteen to sixteen pins at a time, so I had plenty of spares. A bit of work with a screw and nut driver released the KPA100 board from the heatsink. Pulling the old diodes from the board is a bit of a delicate operation, since you want to be carefully not to mess up the board traces. However, with the socket pins, this is the last time you'll do this. Soldering the socket pins in place is one of those operations that would be easier with four hands. Even holding the board in a small Panavise, I needed one hand to hold the machine pin with pliers, one hand to hold the soldering iron, and one more hand to hold the solder. That's one more hand than God gave me, but somehow I managed. Once the pins are in place, it is a simple matter to trim the diode leads and bend them down to fit the socket pins. I had ample spares from my earlier purchase. I checked the diodes with my DVM. (Oh, I should mention that I discovered my 20 year old Radio Shack DVM bit the dust. Apparently one of the AA batteries inside managed to get enough corrosive goo on the circuit board to render it irreparable. So, I had to go out and buy another DVM. It would have been nice to know this before the last hamfest, as these types of devices can easily be had for a few dollars. As I was, I bought a cheap unit at the local Home Depot for about $20. More than I wanted to spend, but I had it in my hands immediately.) These diodes didn't show any obvious odd behavior. The forward voltage was a little off, and the reverse voltage was at the limit, just like you'd expect. Nevertheless, I put new diodes in and ran the calibration procedure for the SWR bridge. Not having a dummy load handy (something else I left at my other QTH), I used a 40m antenna that was a pretty good match. After calibration, the K2/100 seemed to work as expected. I'm surprised how sensitive these diodes appear to be to static discharges. I'm going to have to make sure I keep the rig antenna grounded when I'm not around. A couple of weekends ago, I noticed that Elecraft had updated the release firmware for the K3 back in February. I'm not much for trying beta firmware, but I try to keep up to date. 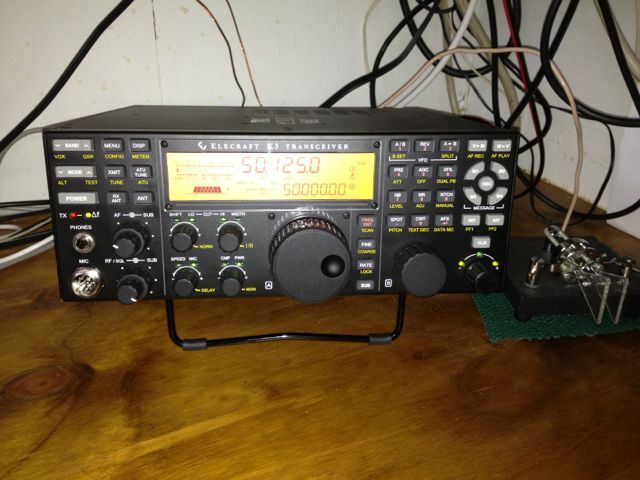 So, I fired up the old Elecraft K3 Utility and set it to go. I did not realize at that moment that I was to undergo a multi-day ordeal. MCU load went OK, but then it decided to upload the FPF. It kept getting stuck on the FPF. I figured it was just a glitch, so I tried it a half-dozen times. Each time, it would fail on the FPF load. Of course, this left the K3 unusable. Without the front panel firmware, there's no front panel. My K3 was just about as useful as a brick. Frantic e-mail to the elecraft email list brought several helpful responses, the most helpful was from Elecraft support. Unfortunately, it would be a couple of days before I could try their suggestions, as I had to leave my Floyd County QTH for Gwinnett County. Three days later, I was able to put my full efforts into the solution. Apparently, I had tried to load the firmware with an old version of the K3 Utility. 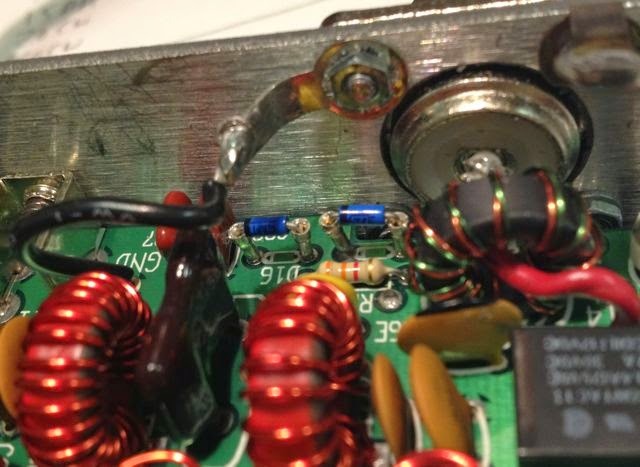 While Elecraft says this won't work, what they don't tell you is that it breaks your K3 in a weird way. That was easy enough to figure out. However, my problem was that even after I updated the utility, it wouldn't load the firmware, either. At some point, someone suggested I try to load the old firmware. Well, doing that is not straightforward. You see, you have to go to your firmware download directory and remove all the files that weren't in the previous firmware. That's not obvious. Eventually, I figured out that the FPF firmware hadn't changed -- only the MCU and DSP firmware were updated. Removing those files, I attempted a full download. Voila! It worked. My K3 is un-bricked. I was now back to firmware 4.67. Now to try the update. Instead of selecting the option to download all firmware, I chose the option of only downloading the updated firmware. That way, it wouldn't have to try to re-load the existing FPF, saving a bit of time. Of course, it upgraded without a hitch. Goes to show you need to use the right tool. And follow directions -- the Elecraft instructions stated you need to use the latest utility. I should have checked instead of just assuming.